Microsoft has added to its cloud-based Office 365 productivity suite with a new communications tool for IT administrators. 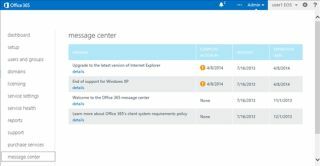 Named Message Center, the feature acts as an internal messaging system that allows Microsoft to notify admins of changes and updates to the service while warning them when browsers and other software becomes incompatible. Accessible via a link in the left-hand sidebar after logging into the admin portal, Message Center displays messages alongside three columns that show when actions need to be completed, when the message was received and when it expires. Microsoft says updates sent via Message Centre go into more detail than information provided in service alert emails, giving admins a gentle nudge in its direction in the process. It adds that the service is set to receive new features over time, including a wider range of languages and information specific to its customers' organisations. It is the latest in a long list of features found on Office 365's tool belt, following integration with Yammer, SharePoint, and Windows 8 OneNote, in addition to business intelligence tool Power BI. Microsoft claimed back in April that the service is well on its way to adding $1 billion to the company's coffers annually.